The first day of the Hindu lunisolar calendar month of Chaitra. Diverse India celebrates Hindu New Year with many different names and traditions. However, this is not the universal new year for all Hindus. For some, such as those in and near Gujarat, the new year festivities coincide with the five day Diwali festival. For others, the new year falls on Baisakhi, which falls a few weeks later. Aluth Avuruthu in Sri Lanka. Celebrated with Rangoli and mango leaf decorations. Special dishes are prepared for the occasion. 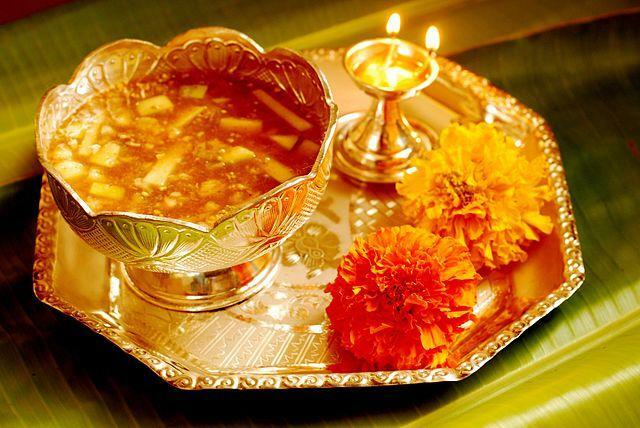 In Andhra Pradesh and Telangana, eatables such as “pulihora, bobbatlu (Bhakshalu/ polelu/ oligalu), New Year Burelu and Pachadi” and preparations made with raw mango go well with the occasion. Of this pachadi (or Ugadi pacchadi) is most notable, and consists of a chutney-like dish which includes ingredients to give all flavors: sweet, sour, tangy and bitter. A practice in Karnataka associated with Yugadi is the panchangashravana (ಪಂಚಾಂಗಶ್ರವಣ).The practice is to worship and read the new panchanga (ಪಂಚಾಂಗ, the almanac) for the upcoming year which lists the fortune of the individuals according to their astrological signs, the rainfall for the year, eclipses that may occur in the year, and a general prediction of the country’s affairs. Observed with Rangoi and Gudhi, a flag pole garlanded with flowers, mango and neem leaves, topped with upturned silver or copper vessel. The festival is linked to the mythical day on which Lord Brahma created time and universe. To some, it commemorates the coronation of Rama in Ayodhya after his victory over evil Ravana, or alternatively the start of Shalivahan calendar after he defeated the Huns invasion in the 1st century. Navreh (Kashmir) Kashmiri Pandits are chiefly followers of Shiva. Their goddess is Kheer Bhawani. The spring of Kheer Bhawani at the mouth of Sind Valley in Kashmir is considered one of their most important and sacred places. 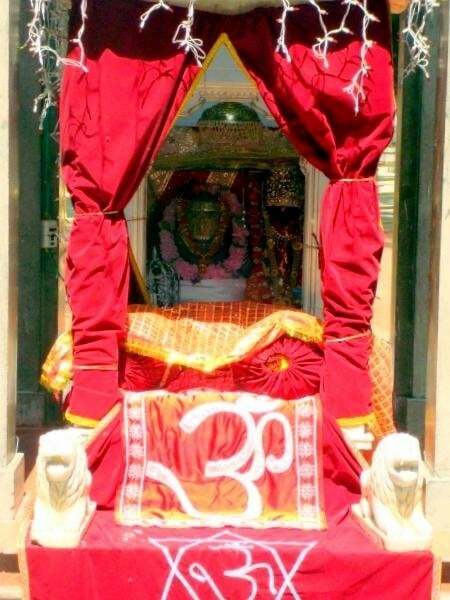 Some holy sites of Kashmiri Pandits include the Martand Sun Temple at Mattan, Mahakali shrine in Srinagar on the banks of vitasta, & above all the Amarnath cave shrine, the pilgrimage to which is conducted during shravan purnima. It marks the birth of Uderolal in year 1007, after they prayed to Hindu god Varun Dev to save them from the persecution by tyrannical Muslim ruler named Mirkhshah. Uderolal morphed into a warrior and old man who preached and reprimanded Mirkhshah that Muslims and Hindus deserve the same religious freedoms. He, as Jhulelal, became the champion of the people in Sindh, from both religions. Among his Sufi Muslim followers, Jhulelal is known as “Khwaja Khizir” or “Sheikh Tahit”. 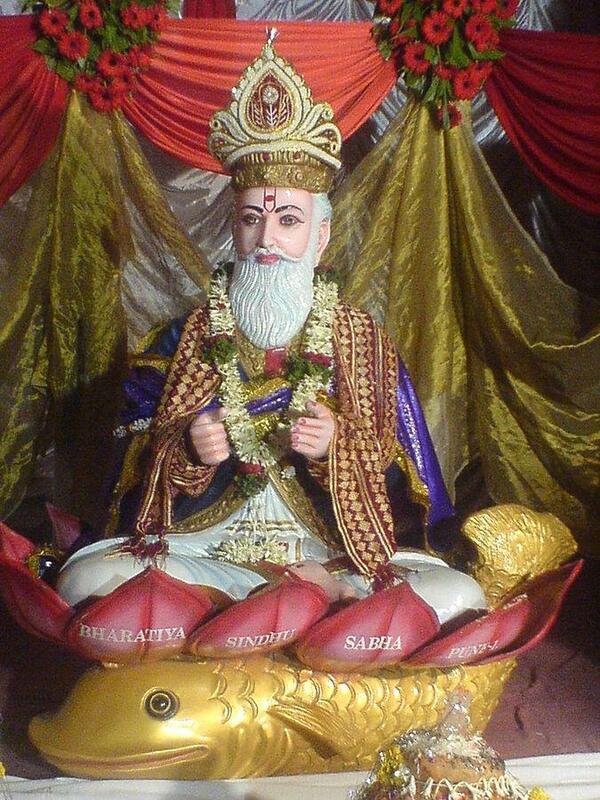 The Hindu Sindhi, according to this legend, celebrate the new year as Uderolal’s birthday. The Meitei people celebrates the festival with great fanfare; gatherings of the extended family and a sumptuous feast for lunch are ‘de rigueur’. The day, begins with ritual offerings of fruits, vegetables, rice and other uncooked food items to the Meitei deity Lainingthou Sanamahi during the early morning of the festival. The preparation of the feast: After getting blessings from Lainingthou Sanamahi, an even number of dishes are prepared using the offerings. Traditionally, the males of the house makes the dishes, with the females helping in chopping and washing the ingredients. It is a tradition that family members climb a small hillock specially prepared by the community near the locality to pay homage to the hill deity, signifying the elevation of the spirit to reach the divine. The “Chin-nga” at Singjamei and “Cheirao Ching” at Chingmeirong are such hillocks that are specially prepared for these hillock climbing ritual. Toy shops, eateries, and other varied small shops will line the road to the hillock on that day to attract the ritual climbers to buy their items. Baisakhi is one of the three traditionally Hindu festivals chosen by Guru Amar Das in which Sikhs and Hindus were to congregate and celebrate together (the others being Maha Shivaratri and Diwali). This day is observed as a thanksgiving day by farmers whereby farmers pay their tribute, thanking God for the abundant harvest and also praying for future prosperity. The harvest festival is celebrated by Sikhs and Punjabi Hindus. Fooldeyi, Bikhauti, Harela, Ghee Sankranti, Khatarua, Uttaraini and Ghughutiya are the most-observed Sankranties throughout the region. ‘Vishu‘ celebrated in Kerala a day after Vaisakhi. The festivities include fireworks, shopping for new clothes and interesting displays called ‘Vishu Kani’. Hindus make arrangements of flowers, grains, fruits which friends and family visit to admire as “lucky sight” (Vishukkani). Giving gifts to friends and loved ones, as well as alms to the needy are a tradition of Kerala Hindus on this festive. Kodava New Year. The Kodavas (Kodava, anglicised as Coorgs), are considered a patrilineal ethno-lingual tribe from the region of Kodagu, (in Karnataka state of southern India), who natively speak the Kodava language. The Hindu Puranas (Kaveri Purana of Skanda Purana) claim that Chandra Varma, a Chandravanshi Kshatriya (lunar dynasty warrior) and son of Emperor of Matsya Desha, was the ancestor of this ‘fierce’ race, the Kodavas. An ardent devotee of Goddess Parvati, he had gone on pilgrimage to several holy places all over India. Chandra Varma had a privy army who escorted him on his campaigns until he came into Kodagu(Coorg). Coorg, the source of the River Kaveri, was uninhabited jungle land when he arrived to settle here. Thereafter he became the first Raja of the Coorg principality. He had 11 sons, the eldest among them was Devakantha who later succeeded him as Raja. They were married to the daughters of the Raja of Vidarbha. These sons and their descendants cultivated and populated the land of Kodagu, they came to be called the Kodava race. 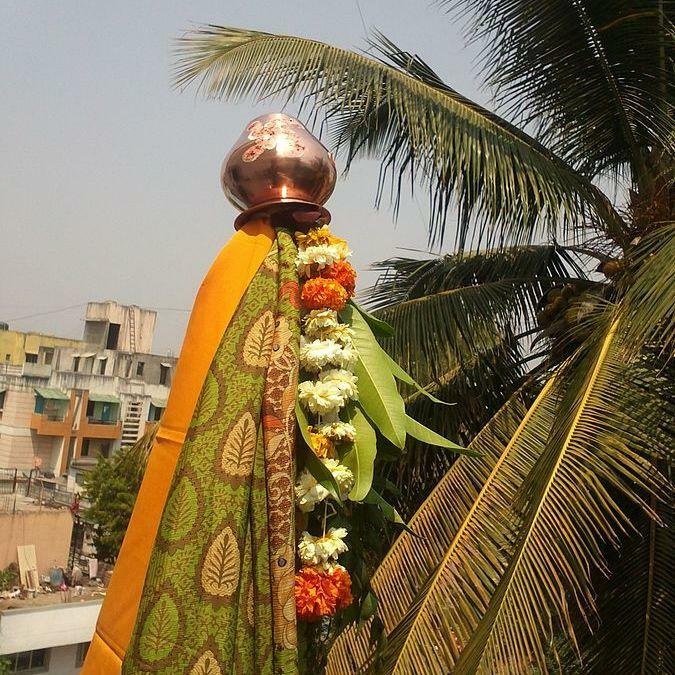 Maha Vishuva Sankranti (or Pana Sankranti) in Odisha, India. The festival is celebrated with visits to Shiva, Shakti, or Hanuman temples, as the day is considered to be the birthday of Hanuman. People take baths in rivers or major pilgrimage centers. Communities participate in mela (fairs), watch street dance or acrobatic performances. A notable climax of the social celebrations is fire-walk, where volunteers sprint over a bed of burning coal while being cheered with music and songs. Feasts and special drinks such as a chilled sweet mango-milk-yoghurt-coconut drink called Pana is shared, a tradition that partly is the source of this festival’s name. During the Vedic period, Mithila was the centre of the Videha kingdom. The rulers of the Videha kingdom were called Janakas. The festival is celebrated with processions, fairs and family time. The traditional greeting for Bengali New Year is শুভ নববর্ষ “Shubho Nabobarsho” which is literally “Happy New Year”. The festive Mangal Shobhajatra is organized in Bangladesh. In 2016, the UNESCO declared this festivity organized by the Faculty of Fine Arts, University of Dhaka as a cultural heritage of humanity.